360 Bridge After Dark – Austin 360 Bridge at dark with a little color still left in the sky from the sunset as the car trails cross the bridge. The 360 bridge is a popular spot to photograph the sunset but it is also a heavyily used road that why I did a long exposure to show how busy this road is as it is a connection from north to south of the city as the car trail show after dark not someplace to be at 5 pm if you can help it. This is on the edge of the Texas hill country near Austin with Lake Austin for boating, picnicing and other recreational activities so it is a popular place. Austin 360 Bridge After Dark – Austin 360 Bridge at dark with a little color still left in the sky from the sunset as the car trails cross the bridge. The 360 bridge is a popular spot to photograph the sunset but it is also a heavyily used road that why I did a long exposure to show how busy this road is as it is a connection from north to south of the city as the car trail show after dark not someplace to be at 5 pm if you can help it. This is on the edge of the Texas hill country near Austin with Lake Austin for boating, picnicing and other recreational activities so it is a popular place. 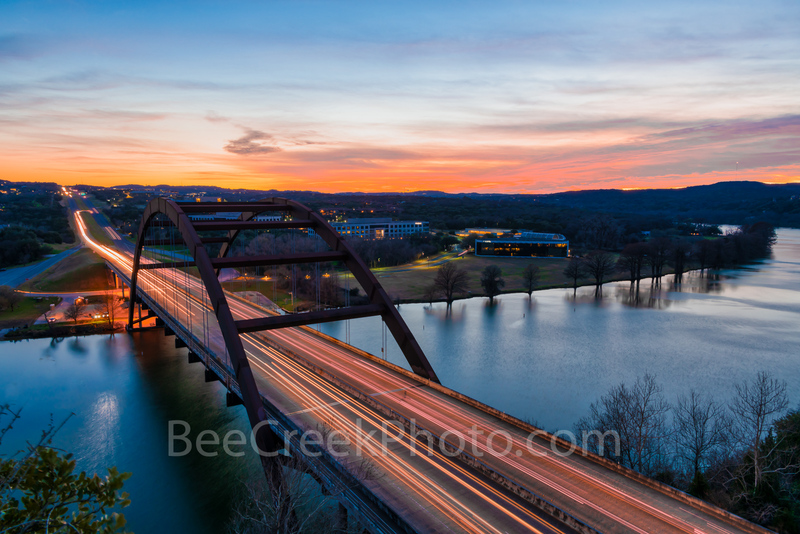 Posted in Best Of and tagged 360 bridge, Austin, boating, boats, bridge, colors, dark, hill country, lake austin, night, Pennybacker, picnicin, recreational, sunset, swimming, Texas Hill Country, texas landscape, Texas scenery on February 18, 2019 March 5, 2019 by Bee Creek Photo. ← Previous: "Bluebonnet Images – Bluebonnets Sunset at Lake"